Providing a wide range of commercial cleaning services and hospitality services on an as needed basis or as full time assistance to your in-house staff. To assist with your everyday operational requirements and delivering exemplary service. We pride ourselves on our friendly and personal approach as well as in-depth understanding of the commercial cleaning service industry. Our underlying value is our team and what that team can achieve on behalf of our partners. We specialize in flameproofing hotels and public buildings in order to enhance public safety. To ensure the safety of occupants, we flameproof curtains, drapes, wood, restaurants, and other buildings used for the public. Our innovative, on-site dry cleaning method allows us to clean drapery in a short amount of time and as a result, allowing you quick room turnaround. Our upholstery and carpet cleaning methods make 20/20 the vendor of choiceby many leading hotels. Should you have any questions regarding any of our services or to find out how 20/20 can fill your every cleaning need, please call our toll free number at +1 (800) 456-2020. We look forward to hearing from you. Flameproofing process that is used for treating natural, as well as synthetic, materials. This is essential to prevent fires from spreading, both new fired and existing fires. Flameproofing involves a chemical know as fire retardant. Flameproofing involves a chemical known as fire retardant. Fire retardant effectively delays the spread of an existing fire. It can also help stop the spread of a new fire in the event one should develop. Fire retardant can be applied to any surface that will allow it to adhere. Flameproofing will save your building, business, and lives. The New York City Fire Department enforces regulations that require all decorations, drapes, curtains, scenery, and other materials used for artistic enhancement inside public buildings to be either non-combustible or flameproof. These regulations also prohibit the use of flammable materials for artistic enhancement inside public buildings. 20/20 will provide the necessary and NFPA approved flame retardants to any approved materials, conduct the field tests, and submit a Certificate of Fitness as required by New York City law. When the materials have been accepted, they may be used on the premises for a period of up to 24 months or until the materials are washed, dry cleaned or otherwise rendered ineffective. As an additional service, 20/20 will clean materials on location without removal of drapes or other materials. We want our clients to be safe and happy. Smart hospitality leaders know that a great guest experience begins with a great first impression. Great hotels dazzle guests during the first 15 minutes of their stay- and that dazzle helps turn one-time stays into loyal, repeat customers. That first great impression is not only important for hotels, but also schools, stadiums, retail outlets, and corporate offices. 20/20 has been restoring stone and metal surfaces for over 30 years. We specialize in marble and work within the commercial and residential markets. If you have scratched, dull marble, stone, or metal surfaces, give us a call for a free estimate. We make marble, stone, and metal new again! We understand and work with the priorities of each of our clients in order to design, execute and manage individualized preventive maintenance programs with minimal interruption to operations. Our stone and marble restoration teams provide the best in industry quality and sustainable results. Utilizing cutting-edge technology and products combined with years of experience, we can revitalize stone surfaces to enhance the natural beauty and aesthetic appeal for both commercial and residential clients. Special attention is needed in high stress, high traffic businesses like restaurants and hotels, but there is no need to worry about your commercial cleaning service when you call 20/20 Hotel Services. 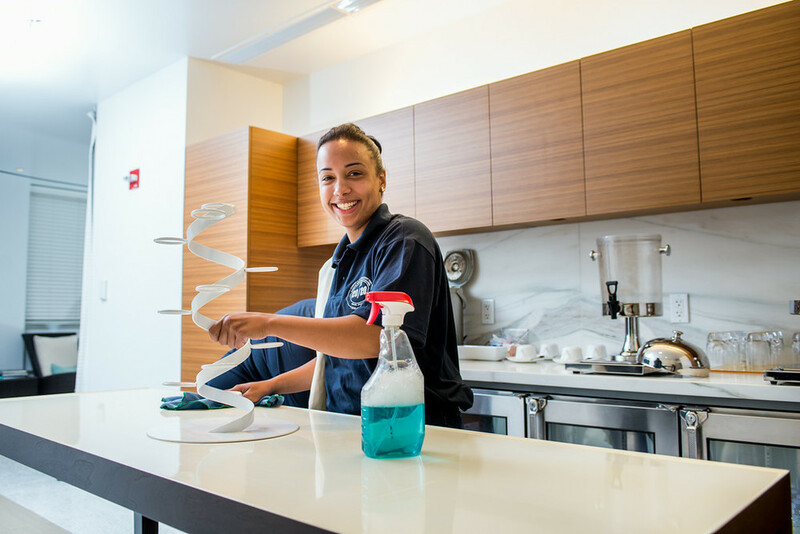 Our experience and state-of-the-art cleaning process ensures we thrive where others cleaners crumble. We have a reliable commercial cleaning service team that has been entrusted in cleaning hotels and restaurants for almost 30 years and we can make your day to day cleaning job easier. As experts, we are familiar with the common issues and problems that can arise in this tough environment. Please give us a call and we will answer any questions you may have and we will explain anything and everything you need to know about our services. Like carpet, upholstery is known to filter dust and other air particles and house them in it’s porous material. A proper cleaning regiment will insure that these particles do not do long term damage to the fibers of your furniture. Soils can scratch the surface of the fibers and make them reflect light differently making areas look worn and dull. 20/20 Hotel Services has the ability to remove these dry soils, oil contaminates, and other stains without letting them get back into the air which would cause a potential indoor environmental pollution issue. Contact us today to set up a free in person quote for all of your professional upholstery cleaning needs. 20/20 will clean all dust, debris, and left-over construction materials from your construction site. We also pay attention to detail, which puts our services above the rest. We will meet your deadlines and work with you and your contractor to work around your schedule. There is no project too big or too small. We have the proper equipment to clean your site with efficiency and give you the results you want. Our state of the art process removes harmful dust and allergens without damaging fabric. Our on-site service basically brings our dry cleaning plant to your premises with our safe dry cleaning process. We inspect for damage and lubrication; pins, hooks and runners are replaced if needed. We make sure that drapes are carefully labeled so that they are re-hung on the same window and all labels are removed after cleaning. We hand fold all drapes after cleaning so that no stretching occurs, thus eliminating damages and fabric stress. Drapes will be cleaned and re-installed within the same day. Our Off-Site service will be able to handle larger orders with a 24-48 hour turn-around. We offer you the opportunity to establish a regular rotation of drapery maintenance based on your individual needs as well as the industry standards. We will provide a consistent quality of service that ensures maximum life from the investments you have made on your draperies. Our drapery maintenance program is a tailored fit cleaning schedule that has a complete and thorough inventory. Our custom tracking system allows us to customize a schedule for room cleaning that works for your hotel. I needed a company that knew marble floors. 20/20 keeps the marble floors at my hotel beautiful and shiny. The staff has proven to very dependable; they do an exceptional job and are a pleasure to work with.